Circonus: One Step Install, or C:OSI, is a new feature that enables a single prescriptive way to automate the process of bringing systems online and get metrics flowing from a new host into Circonus. This enhancement allows users to run a single command on a new node and it will automatically "self-instrument" important graphs, metrics, and worksheets. Just plug in the key and app values and run that command on a host. One step; that's it! Figure 1: Circonus GUI with C:OSI instructions exposed. Log into Circonus API tokens. 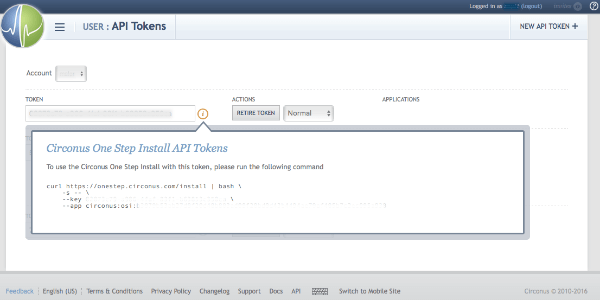 If you don't have any tokens, you'll need to add one by clicking the "New API Token +" button. Next to each token there is an information icon (i). Click this icon to expose the C:OSI command for that token. Select and copy the C:OSI command from the dialog. Run the installer command on a host. You're done! It configures the agent to expose metrics. It creates a check to retrieve and accept the metrics from the agent. It enables basic system metrics. Optionally, it can also create a worksheet containing the basic graphs so there is a unified view of the specific host. Command line options - to change the default configurations installed by C:OSI. Installer Options - to set environment-wide options that change C:OSI's default behavior. Configuration templates - to change the way C:OSI sets up default metrics, graphs, and worksheets. Registration options - to override defaults and provide custom data to be used in configuration templates. Installation hooks - to perform custom actions before or after NAD installation. By modifying the C:OSI command, these options allow discerning users to benefit from the flexibility Circonus offers while still enjoying the simplicity of automating their onboarding process with C:OSI.